The Flawless Collection consists of products that help to fight active acne and breakouts. If your main concern is dark spots and uneven skin tone, check out our Glow Collection. You can mix and match items from both collections to address all skin concerns! Velvet Cleansing Butter Balm is a gentle, sulfate-free lathering oil cleanser that effortlessly melts away makeup and dirt while keeping the skin soft and nourished. Babassu Butter is excellent for acne prone skin, as it is anti-bacterial, anti-inflammatory, and non-comedogenic, meaning it won’t clog pores. Castor Oil is a soothing astringent oil with anti-inflammatory properties. It helps remove dirt and excess oil from the skin. Shea Butter is rich in fatty acids and easily penetrates the skin, leaving skin nourished and buttery soft without feeling oily. Safflower Oil is great for sensitive, acne-prone, congested skin. It helps speed up recovery from breakouts and acne scars. 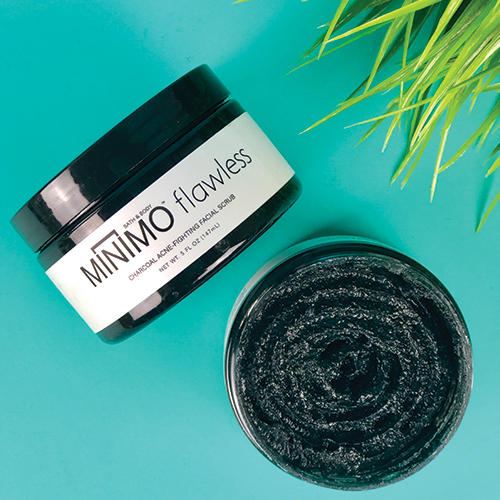 Flawless Charcoal Facial Scrub is a rich, exfoliating blend of activated carbon charcoal and nourishing botanical extracts that help deeply cleanse & maintain healthy, smooth skin. Rose Soothing Acne Control Toner is a gentle, pH balanced facial toner that deeply cleanses pores with powerful ingredients that help keep acne under control. Naturally fragrant from soothing rose water and alcohol free, Minimo Rose is specially formulated to remove dirt and residue without stripping the skin of natural oils. DéjàVu Daily Facial Serum is a concentrated, nutritive blend of botanical extracts that easily penetrate and nourish the skin. Miracle Mud Mask is an intensive at-home spa detox that minimizes the appearance of pores. A propriety blend of 3 powerful clays gently removes dead skin tissue while uncovering bright, youthful-looking skin. Miracle Mud Mask leaves skin healthy and baby soft after one use. Miracle Mud Mask easily spreads on the skin and stays soft and supple after application, meaning that your face won’t be dry or crunchy during the 20-minute treatment. The Minimo Scrubbie cleans and exfoliates while opening pores and gently removing impurities and dead skin. Massaging your skin with the Minimo Scrubbie also helps promote blood circulation and can be use in combination with any of our face or body scrubs. The Minimo Scrubbie is made of food grade silicone material, which is BPA-free, FDA-approved, LFGB standard, easy clean, and quick drying to reduce breeding of germs. The Minimo Scrubbie is gentle enough for all skin types, especially for sensitive skin. Mild, sensitizing, and non-abrasive design. A combination of thick, soft bristles, gently exfoliate the skin and allows for easy rinsing with each use. A finger handle allow for an easy two finger operation with no concern of slippage. Wash Face using the Velvet Cleansing Butter Balm. Wet face and apply the Flawless Facial Scrub using the Scrubbie. Add water to increase spread if needed. Rinse well and pat dry with dark colored towel to prevent staining. Apply the Rose Toner to remove any remaining residue and balance the skin's pH. Massage a pea-sized amount of the Honeydew Moisturizer into skin. Specific instructions for use of each product are detailed on the jar.